Adrants reader John Brock sent us this amusing radio commercial, created as a joke by church member Mike McKenzie, for Birmingham, AL St. Andrew's Episcopal Church. The spot mirrors the tone and style of those monster truck "Suuuundaaaaaaay" commercials replacing the the usual auto-speak with church-speak. While it's not an official commercial for the church, it has been heard by church leadership who may decide to air it. There's also an airline version of the spot. Church is stuffy. Life used to be stuffy. The two went hand in hand beautifully. Today, life isn't stuffy but church remains so. 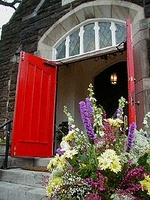 Just as the United Church of Christ, one of the most liberal mainstream churches, did with its "we accept all" gay-themed spot, the Episcopal Church, Catholic church without the pope and circumstance, could surely use some self-referential humor to attract jaded, modern Americans through the doors on Sunday.